Too many times I’ve tried a product that’s labeled for sensitive skin, only to still have some kind of reaction from it, whether it’s small red bumps or just very drying. In a world flooded with marketing everywhere we look, it’s tough making decisions in an effort to find the right products for us, and even harder to actually find the right products! So, I have discovered yet another one of the shaving creams that’s touted to be good for sensitive skin. This one is made by a brand that many love and trust: Aveeno. I tried the Aveeno Naturals Therapeutic Shave Gel, to be exact. I’ve used many Aveeno products and have grown to love the product line over the years for many reasons. It was pretty easy to find a few things that I absolutely loved about this Aveeno product! Cost-effective. They say you get what you pay for and that case is true with this saving gel for women…and then some! You shouldn’t have to break the bank in order to get a good shave. Amiright? Easy to use. Wet skin, apply, lather, shave, rinse. Easy and predictable unlike some other shave creams I’ve tried. I don’t know about you but I like to be able to grab and use a product when I’m half awake in the morning and not have to think about exactly how to use it! A little goes a long way. This stuff spreads pretty well which is another reason why it’s good on your bank account! You won’t just blow through the whole can! Gentle on skin. Probably my favorite part. There is zero sting-factor. Zip. ZILCH! Not upon application, and not after a few sharp, little razors have grazed the surface of my skin. It’s nice! No overpowering scents. I’m not one for all of those artificial scents that seem to want to trick my legs into thinking they went on some kind of vacation in the tropics! I’ll stick with my more natural scents, light or unscented. If it has to have a strong scent, I have to ask myself what kind of chemicals it’s covering up. Moisturizes. Because this cream is moisturizing (perhaps because of the oatmeal?) you don’t need to apply any kind of lotion afterwards to get the smoothness we all seek for out legs! No razor bumps. Not only do razor bumps hurt, but they’re unsightly. Even using a subpar razor, I still have yet to get razor bumps whilst using this. A major advantage for my sensitive legs! No rust rings. I love the aerosol shaving creams but I hate the rust rings they can leave in your shower. Well done, Aveeno! Problem solved with their rust-proof packaging! Not storage-friendly: The can is a bit big for a shaving gel for women. Sure, you can always just stick it in a corner of the tub, but if you have mischievous, pint-sized people in your home, you want it out of reach. It fits awkwardly in my shower caddy, so I keep it stored in the locked sink cabinet. I do like to keep mine stored in the shower so I’d love to see more compact cans! Rinses easily: This can be a good thing and a bad thing. Keep away from running water unless you want to re-apply mid-shave. 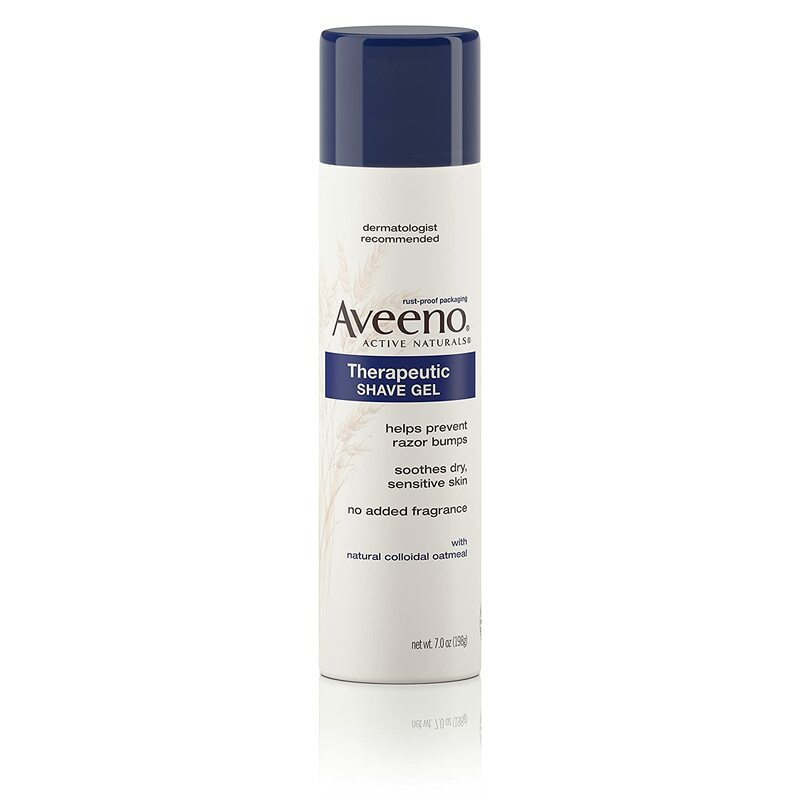 Would I recommend Aveeno Therapeutic Moisturizing Shave Gel? This is hands down the one I’ll be recommending the most out of all of the shaving creams and shaving gels that I’ve tried. It has terrific, glowing reviews, and for a good reason! The ingredients aren’t as terrible as a lot of other shaving gels out there on the market (although not as clean as say…Kiss My Face), and the price is right! So, what are you waiting for? Don’t we have some coffee to grab?